Eight days ago, Double-A Reading manager Dusty Wathan didn’t believe his shortstop was long for the Eastern League. Do Phillies finally have a productive corner outfielder in Tyler Goeddel? A week and a day later, Wathan will need a new starting shortstop. The Phillies announced on Friday morning that Crawford, the 16th overall pick in the 2013 MLB Draft, has been promoted to Triple-A Lehigh Valley. "Feels great," Crawford told PhillyVoice on Friday morning. "I get to be with some of my good friends from last year." The 21-year-old joined the likes of outfielder Nick Williams, catcher Andrew Knapp, and righthanders Jake Thompson and Zach Eflin, all teammates at Reading last year, on Friday in Allentown. Like the rest of the growing talent at Triple-A, Crawford is one step away from the major leagues. "It's weird to think I'm only one step away," he said. "But I gotta keep putting in the work everyday and find a way to get better everyday." 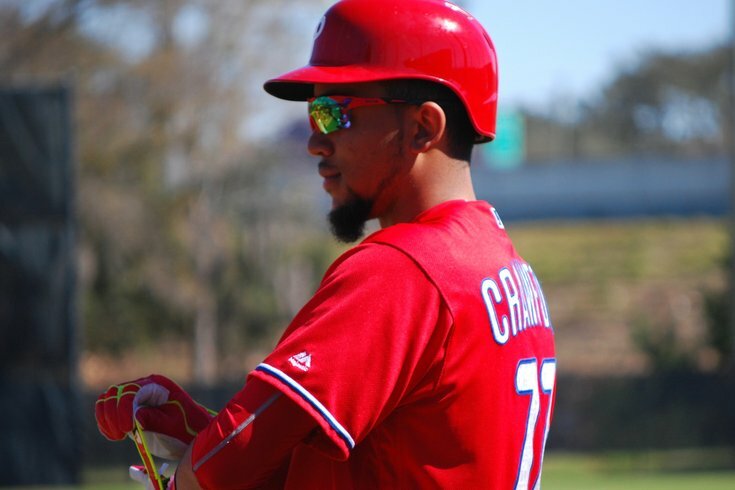 Crawford spent close to a full calendar year at Double-A after he arrived at Reading on May 30 of last year. In 122 games there, he hit .265. But you have to look beyond his batting average to truly appreciate Crawford’s skill set as a gifted shortstop with plate discipline that’s unusual for a kid who only turned 21 four months ago. Crawford’s .398 on-base percentage ranked 10th in the Eastern League this season. He’s struck out just 21 times while drawing 30 walks in 166 plate appearances this year. In his minor league career as a whole, Crawford has more walks (192) than strikeouts (190) in 319 games. Crawford found out about the promotion after Reading’s 5-1 win at Bowie on Thursday, when he hit a solo home run. Crawford was hitting .265 with a .398 OBP, .787 OPS, three home runs, and eight doubles in 36 games with Reading this season. Crawford was ranked the fourth-best prospect in all of baseball this winter by Baseball Prospectus. Baseball America had him rated sixth on their own offseason list. Meanwhile, MLBPipeline.com, which edits their rankings regularly, currently has Crawford ranked as the third-best prospect in baseball. Perhaps, like Aaron Nola, who made just six starts in Triple-A, he's making quick-ish pit stop with the 'Pigs before arriving in Philadelphia later this summer. But Crawford, drafted out of high school, is a year-and-a-half younger than Nola, so maybe he's more likely to arrive in September. Sixteen years ago, a 21-year-old Jimmy Rollins began his own prolific Phillies career as a September call-up. If you want more, here's a big read on Crawford from last summer.